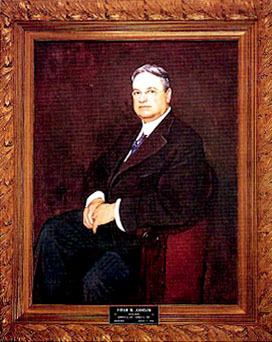 Hiram Johnson was born and raised in Sacramento, where he was also indoctrinated into politics. As a young man, he accompanied his father, armed with pistols, into a "den" of dishonest politicians. There his father fearlessly denounced them for their corruption. Although the political poles of father and son were to differ in later years, the younger Johnson was never to waiver in his campaign against corruption. Johnson initially worked in his father’s law office as a stenographer. He left this position to attend college at the University of California. He left college during his junior year to get married. In 1886, Johnson returned to his father’s office to work as a shorthand reporter and study law. He was admitted to the California bar in 1888. He attracted the attention of politicians statewide when he successfully took over as special prosecutor in the notorious 1906 graft trial of Boss Abe Ruef after the chief prosecutor was gunned down in the courtroom. The Lincoln-Roosevelt League asked Johnson to run as the reform candidate for Governor. Johnson reluctantly accepted. This gubernatorial campaign was significant as it was the first in California to use the direct primary system. This was the first public office Johnson held. Part way through his second term as Governor, Johnson was elected to the US Senate. He would serve five terms in the US Senate, from 1917 to 1945. Use the California State Library’s interactive tool to view Executive Orders and Proclamations signed by Governor Johnson.